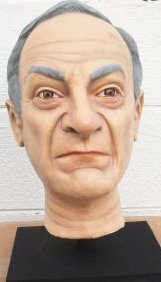 Here is a fan made latex/rubber head of the late actor Jonathan Harris, who played Dr. Zachary Smith on Lost in Space. This displayable head piece was professionally sculpted and painted. Great likeness on this loved actor.